Kazakh wheat prices fell to roughly half international levels, and to below the cost of transporting the grain to port, depressed by a shortage of silo space which has left farmers storing grain in rail wagons. Prices of third grade milling wheat at the Kazakhstan border with Russia tumbled over August and September by 40% to $132 tonne, roughly half the price that importers were paying at ports, data from US Department of Agriculture attaches showed. Prices of lower-quality fifth grade wheat also plunged 40%, to $117 a tonne. The falls came amid a harvest which is expected to prove the country’s highest since 1950, exceeding 27m tonnes before cleaning and drying, but a dearth of opportunities for selling the grain. The former Soviet Union state uses only about 8m tonnes of grain a year itself, although it is attempting to boost that figure through expanding its livestock industry, with plans to become a beef exporter. 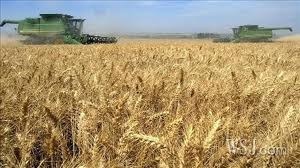 "Due to its landlocked status and infrastructure problems, Kazakhstan continues to experience logistical difficulties with getting its wheat to export markets," the attaches, based in the Kazakh capital of Astana, said. "While last year, Russia’s ban on grain exports allowed Kazakh grain largely unencumbered access to Russian ports, this year with very strong exports from Russia, Kazakh grain companies are having difficulty finding port access." Indeed, transporting Kazakh grain to Black Sea or Baltic ports from where it can readily be shipped to world buyers costs $160 a tonne. The desperation to get shot of grain is enhanced by a shortage of elevator capacity, estimated at 22.8m tonnes including on-farm silos, which has forced storage in railway wagons and trucks parked on laybys, as Agrimoney.com revealed. "Storage is still in deficit, especially in key growing areas, and this deficit is estimated at between 1.5m-2.0m tonnes," the attaches said. Kazakhstan’s logistical squeeze, which the government is attempting to remedy through measures such as improving access to China, and through Iran, is the most severe within the Black Sea grain states, but not the only example. Russia has suffered congestion on rail routes to ports, limiting its pace of exports, while Ukraine’s grain shipment capacity of some 2.5m-2.7m tonnes a month is seen limiting its ability to trade, after it ditched crop export levies. "Russia has been asked to provide trains to Kazakhstan, but the railway tranportation system is already overloaded in Russia this year," Agritel’s Kiev office said. "Ukraine, Russia and Kazakhstan need to invest in new infrastructure in order to go with the growth in agriculture, which represents a crucial source of currency for these countries."